If you drive a Pontiac or an Oldsmobile and think “man, GM really abandoned the car I drive” well, spare a thought for Scripps-Booth, one of the first marques that General Motors phased out. Founded in Detroit in 1913 by James Scripps Booth (of the wealthy publishing family), Scripps-Booth was absorbed by the Chevrolet division of General Motors in 1917 after the company switched to using Chevy engines and away from the Sterling engine that proved problematic in this, the Model C. The Model C was introduced in 1915 and for 1916 (when this particular car was probably built) used a 1.9-liter straight-four making 20 horsepower. 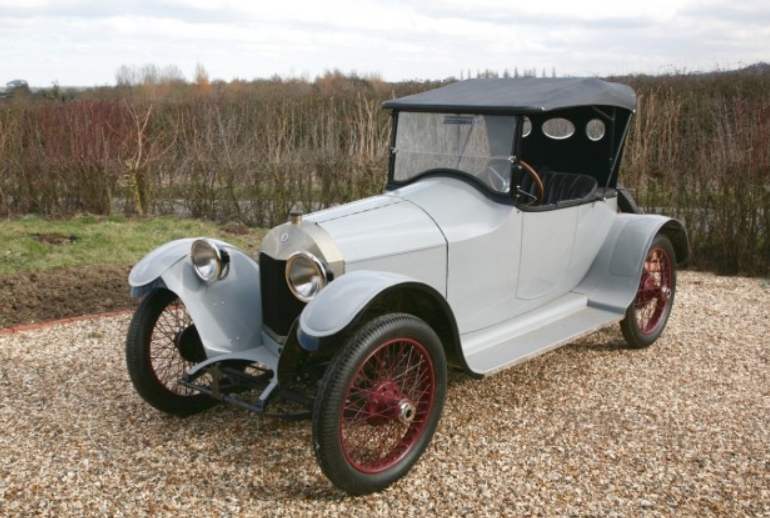 But that Sterling engine proved very unreliable and saddled the Scripps-Booth with some unsavory nicknames like “Scraps-Bolts” and “Slips-Loose.” This car was sold new in Colorado and now resides in the U.K. It has known ownership history from new and was restored in Indiana before crossing the Atlantic. GM shuttered Scripps-Booth after the 1922 model year, making it an early casualty of their empire. Not many are left and this one should bring between $26,500-$30,500. Click here for more from Brightwells. This entry was posted in Uncategorized and tagged 1917, auctions, brightwells, cars, classic cars, roadster, scripps-booth, type c by classiccarweekly. Bookmark the permalink.